Flight 370 disappearance: Missing airliner apparently flew to Central Asia. Missing Airliner May Have Reached Central Asia. Could the Passengers Still Be Alive? 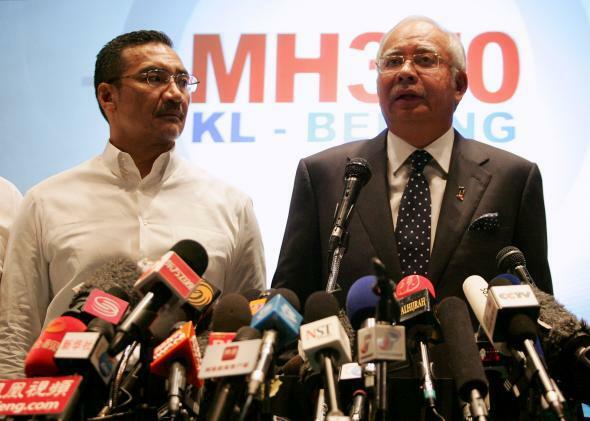 Datuk Hishammuddin Hussein (L), acting minister of transport, and Malaysian Prime Minister Najib Abdul Razak update the media on the search for MH370. At a press conference today in Kuala Lumpur, Malaysian Prime Minister Najib Razak confirmed what many, including Slate, had already inferred about the fate of missing Malaysia Airlines Flight 370: that it had not succumbed to an accident but instead had been diverted as a result of “deliberate action by someone on the plane.” Further information released by the Malaysian government indicated that the plane ended its flight in a restive area of Central Asia. From this point onwards, the Royal Malaysian Air Force primary radar showed that an aircraft which was believed—but not confirmed—to be MH370 did indeed turn back. It then flew in a westerly direction back over peninsular Malaysia before turning northwest. Up until the point at which it left military primary radar coverage, these movements are consistent with deliberate action by someone on the plane. According to the new data, the last confirmed communication between the plane and the satellite was at 8:11 a.m. Malaysian time on Saturday 8th March. The investigations team is making further calculations which will indicate how far the aircraft may have flown after this last point of contact. This will help us to refine the search. 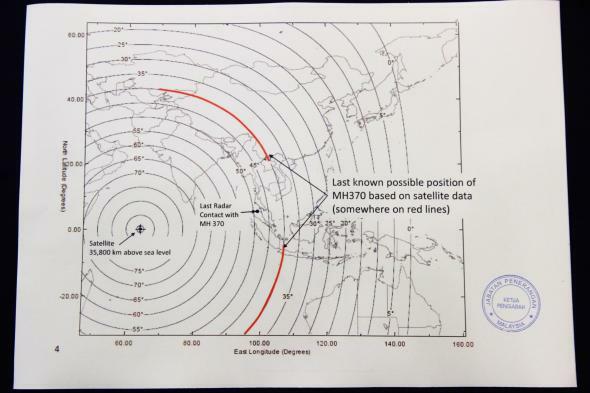 A chart released by the Malaysia government showed the aircraft’s range of possible positions based on the distance traveled by an electromagnetic ping detected by a satellite over the Indian Ocean at 8:11 a.m., at which point, apparently, the plane was still airborne but nearly out of fuel. It consists of two arcs (shown here in red), the northernmost of which goes from the northern border of Vietnam through western China to the eastern portion of Kyrgyzstan and includes the Chinese province of Xinjiang, heartland of the Uyghur ethnic minority. A violent separatist Uyghur separatist movement is active in that area. Two weeks ago, eight knife-wielding Uyghur separatists attacked passengers at a train station in Yunnan, killing 29 people. * According to its manifest, 153 of the 227 passengers aboard MH370 are Chinese. Based on the satellite data alone, the plane could also be located in the southern Indian Ocean west of Australia, southwest of Java. But that area is mostly empty ocean. Given its speed and time aloft, MH370 could have traveled about 3,300 miles in the six hours between the time it was last spotted near the Andaman Islands and the time the final ping was detected by satellite. The distance from its last known location to the farthest end of the northern arc is about 2,400 miles. That implies that the flight took a circuitous flight path. How it evaded the military radar systems of the intervening countries is unknown. Update, March 15, 9:10 a.m.: When the flight first disappeared from air traffic controllers’ radar a week ago, the default assumption was that the plane had crashed. Now it seems unlikely that a plot as ingeniously planned and carefully executed as this one would not also have included plans for safe arrival at some ultimate destination. As I reported earlier, the 777 is capable of landing on small airstrips and on relatively unimproved surfaces, such as packed dirt and dry lake beds. In such a scenario, the odds are good that, unless they were murdered, the passengers remain alive. The motives and intentions of whoever took MH370 remain as murky as ever, but possibilities include a hostage scenario, the repurposing of the aircraft as an enormous flying bomb, or some combination of these and other outcomes. If the plane landed safely and the passengers weren’t killed, why haven’t we heard any ransom demands? The perps might be covering their tracks, or they might be letting the world media whip themselves into a frenzy. *Correction, March 17, 2014: This blog post originally and incorrectly said that a knife attack that killed 29 took place in Xinjiang, China. It occured in Yunnan. Jeff Wise explains why he thinks that the northern arc is the more likely scenario.